There are 7 good reasons why you should choose IS-Energy floor and wall heating systems. Invisible, silent and no draughts providing cosy and radiant heat. Ideal for combination with heat pumps, solar and biomass systems. Our floor and wall systems consist of a layer of pipes installed under the floor or on the wall. Part of the heat is then transferred into the building mass. Because the system works at lower temperatures it is much more efficient than radiators and it´s economically a good choice, as in keeping your heating costs low when used in combination with other renewable energy sources such as solar or heat pumps. Moreover, it operates in any kind of floor covering (stone, tile, and wood). wall, ceiling and floor surfaces. The comfort of having a room temperature between 25°C and 30°C and the liberty it provides in terms of decorating and designing your own space are some of the great advantages. Since the heat is transferred invisibly inside the floor or inside the wall, no visible components have to be planned for, such as recesses for heating devices, radiators and pipes. These almost unavoidable ‘subtenants’ in expensive living space require a lot of room and are not pleasing to the eye. They restrict both the wall and window design and the space where furniture can be positioned. Combined floor heating and wall heating systems complement each other perfectly in living spaces. They allow for tailor-made heat supply in every room. The right floor and wall heating system not only gives you optimum comfort, it also saves energy and money. The cost of operating a floor/wall heating system can be reduced due to low surface temperatures and hence low heating water temperatures. Floor heating is therefore ideal where low-temperature energy sources are used, such as heat pumps and solar collectors. 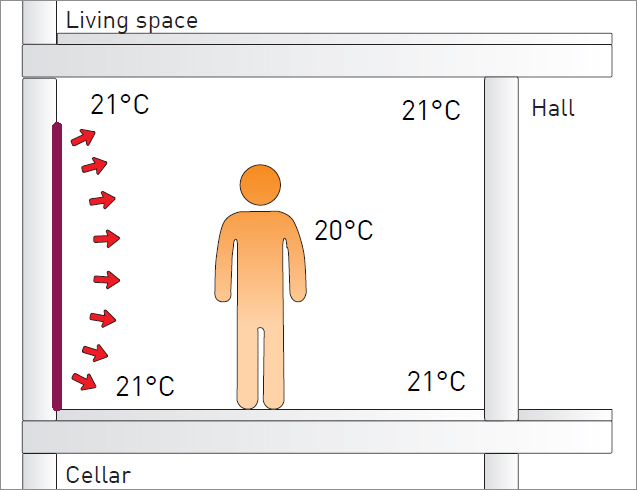 The approximate cost savings per 1 K (°C) lower room air temperature are 6%. Low room air temperature also has the great physiological advantage of significantly increasing the absorption of oxygen.